I am joining in with Meet Me At Mike's excellent Week Of Lists. 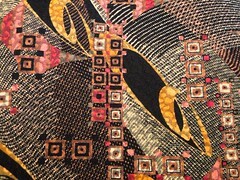 This time I am listing some of my favourite places to buy interesting dress fabric in Melbourne. If you're not local, then you might like to check out the websites, as some of these shops sell online too. A beautiful shop filled with thousands of bolts, including a really wonderful selection of stretchies and some divine evening fabrics. There is off-street parking behind the shop. A shop like they used to make them. The service is fantastic and the store is jam packed with gorgeous fabric. Carmel's is a 45 minute drive for me ... and worth every bit of the time it takes to get there. I remember how I used to love visiting Clegs with my grandmother when I was a little girl. Its lost none of its allure. The selection of special occasion, eye-candy fabric is just gorgeous. The new kid on the block (for Melbourne, that is), Tessuti is laid out like a beautiful boutique and filled with stunning colour-sorted designer fabrics. If you live in Melbourne and sew and haven't been yet, you really must! Huh? Sydney? Admittedly, a little bit on the outskirts of Melbourne (by 963 kilometres) but this shop does fabulous stuff. And as a bonus its online. I have bought a number of pieces of fabric and despite the ability to oooh and ahhh and touch, I haven't been disappointed. Do you have all-time favourite that belongs on this list? Is there somewhere I need to visit?? Later: more lists, including my favourite sewing tools and publications. Thank you!!! It's so useful to know about alternatives to the dreaded ridiculously messy large chain stores, and I'm not far at all from the Cloth Shop. I might need to go and check it out. Soon! My addition to the list is high end but v.nice! I bought a few things last week, and did a post of them. Rathdowne Remnants, another one in Heidelberg on a corner that I can't remember, and ye olde Job Warehouse in the city although it may not be there anymore... Great list Liesl - thanks for sharing it! Isn't it sad that I haven't been to any of them. I will so have to fix that. I used to go to Clegs with my grandmother when I was little and it was like another world to me... all shiny and lush! Great list, and thanks for the top two which I will set aside a day to visit very soon! Please don't ever visit Carmels without letting me know. That's right in my neck of the woods! You're bound to be thirsty and / or hungry after that long journey.